Laid down, 11 August 1943, at George Lawley & Sons, Neponset, MA . 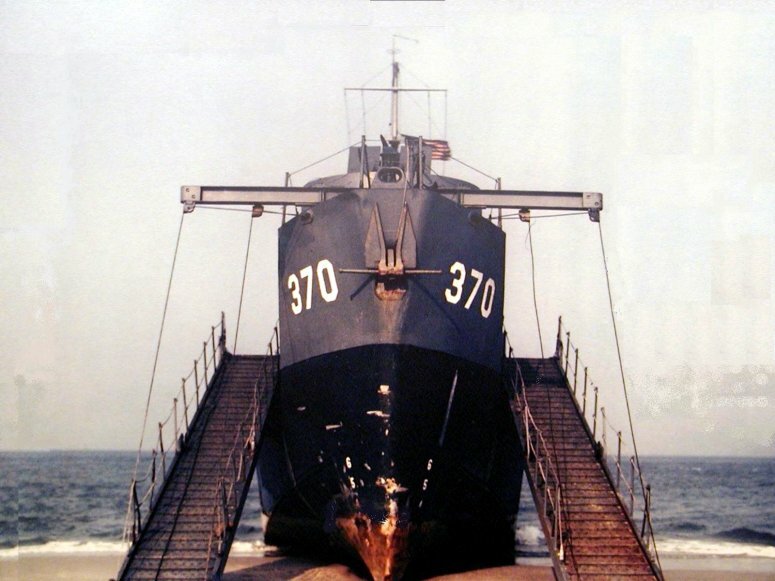 141k USS LCI(L)-370 beached, date and location unknown. This photo is on display at the Navy Memorial in Washington, D.C. in their permanent exhibits. 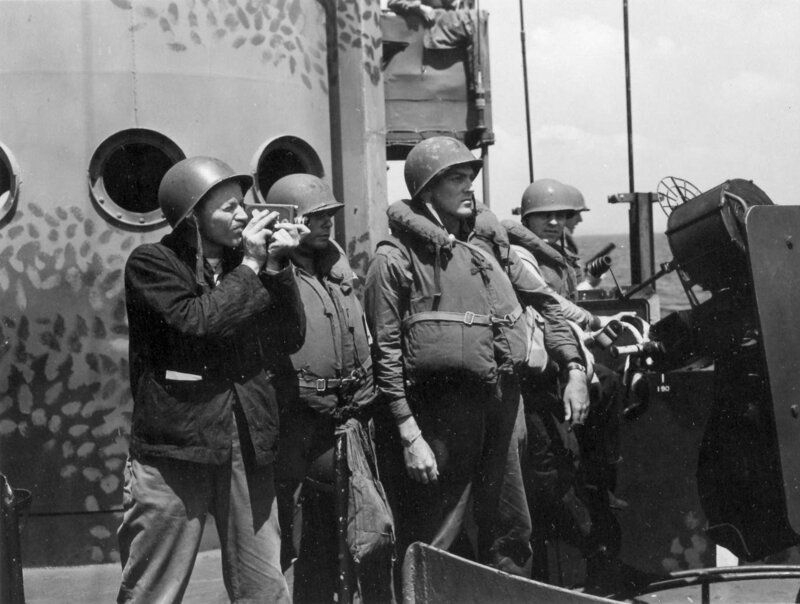 USS Landing Craft Infantry National Association's "The Elsie Item." Issue #46, October 2003. 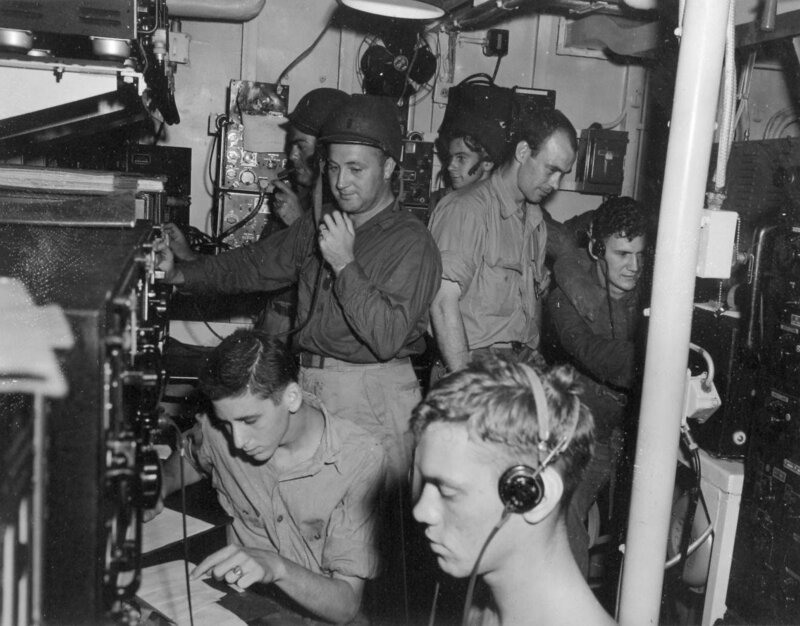 221k LCI(R) Flotilla 16 staff man the radio room aboard (seated, foreground, left is S. Cranke RM3/c, R.A. Klotz S1/c and standing left H.H. Klcempke S1/c and standing closer and center left E.J. 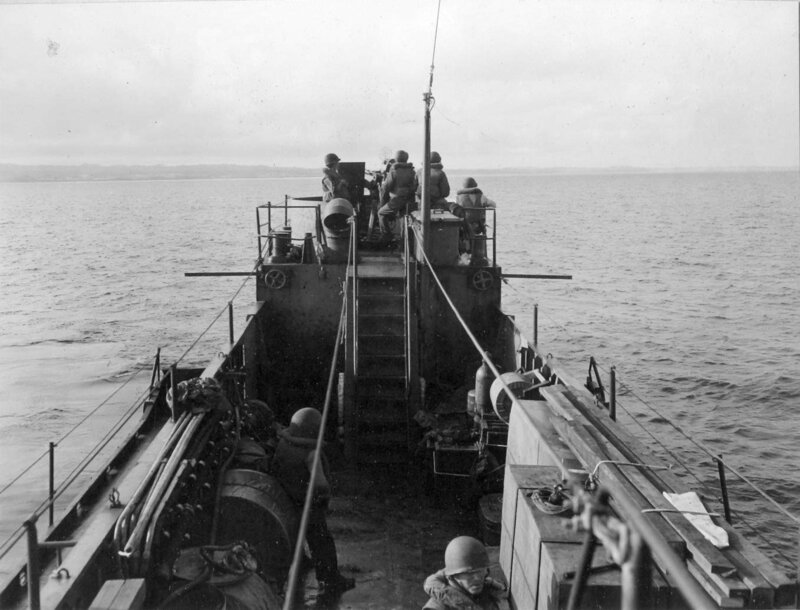 Grover CRM and George Weber RM1/c)USS LC(FF)-370 during General Quarters, while off the invasion beaches at Okinawa, circa March-June 1945. 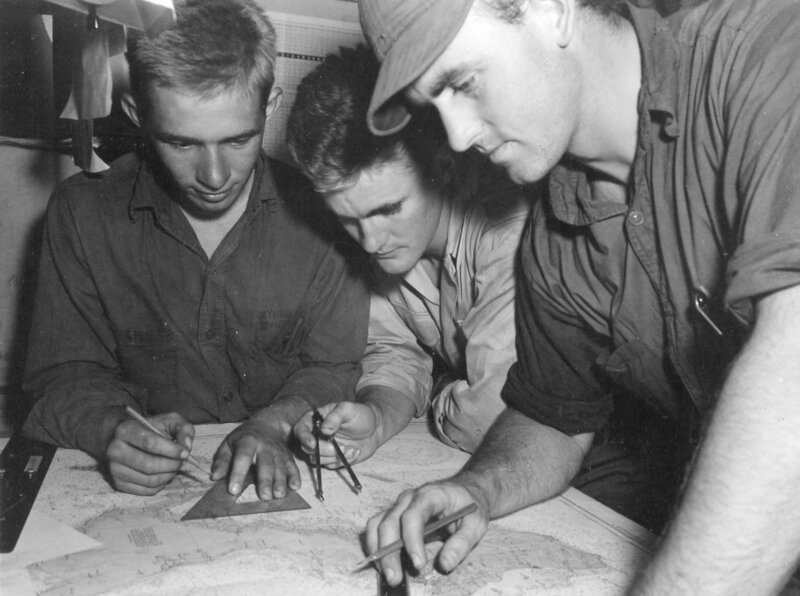 182k LCI(R) Flotilla 16 staff go over the maps of Okinawa while aboard USS LC(FF)-370 off the invasion beaches at Okinawa, circa March-June 1945. 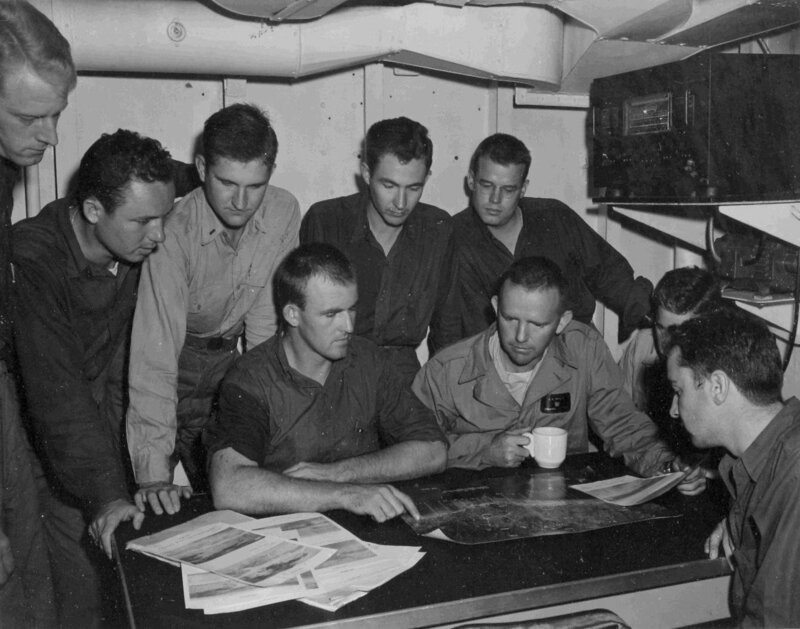 214k CDR Clarence E. Coffin briefs LCI(R) Flotilla 16 staff officers aboard USS LC(FF)-370 while off the invasion beaches at Okinawa, circa March-June 1945. Left to right; Ltjg A.W. Hamba, LT. Frank H. Tinkler, LTjg Herbert M. Dickey, Ens. Eadon F. Keith, LTjg Robert E Gibson and CDR. Coffin seated. Standing right is LTjg Floyd V Turner, Ens J.C. Jones and LT james W. Menofee. 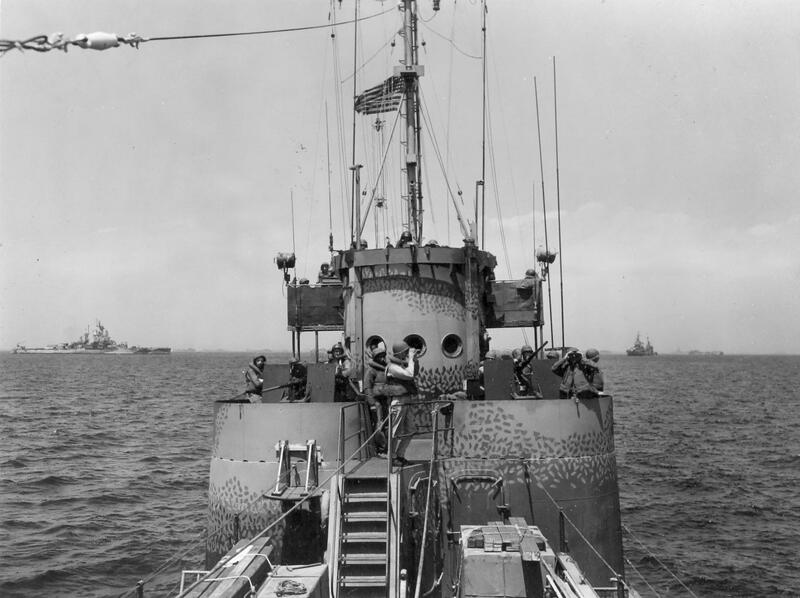 121k CDR Coffin LCI(R) Flotilla 16 aboard USS LC(FF)-370 while off the invasion beaches at Okinawa, circa March-June 1945. 172k USS LC(FF)-370 with LCI(R) Flotilla 16 aboard underway off the invasion beaches at Okinawa, circa March-June 1945. 183k View looking aft over the stern of USS LC(FF)-370 with all guns manned while underway off the invasion beaches at Okinawa, circa March-June 1945. LCI(R) Flotilla 16 aboard. 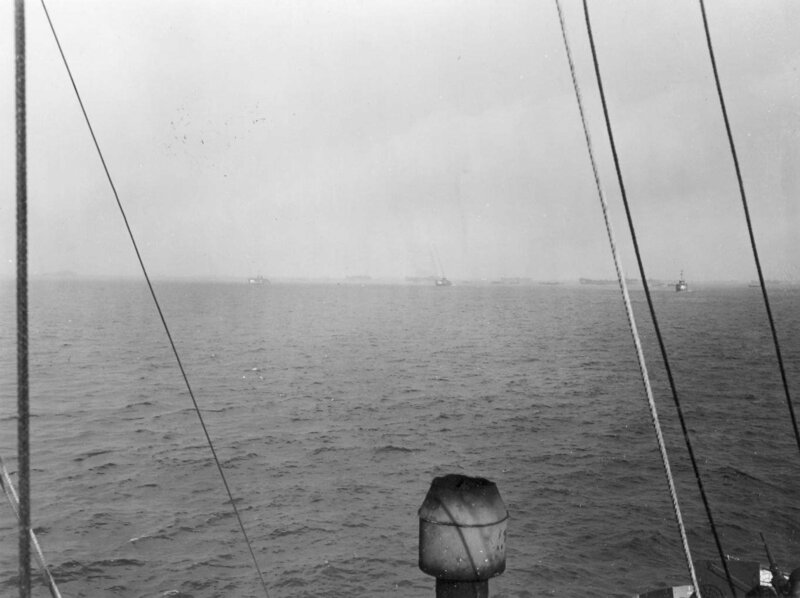 202k View looking toward the bow of USS LC(FF)-370 with all guns manned while underway off the invasion beaches at Okinawa, circa March-June 1945. LCI(R) Flotilla 16 aboard. 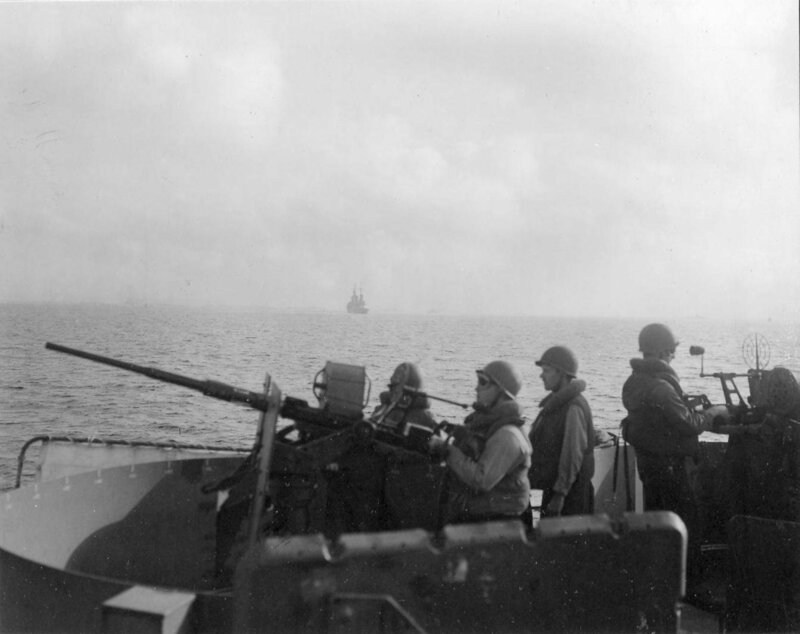 121k USS LC(FF)-370, portside 20mm waist gun, Loader Jack Oosterbaan S1c, Pointer J. Harding S1c manned and ready during General Quarters while underway off the invasion beaches at Okinawa, circa March-June 1945. LCI(R) Flotilla 16 aboard. 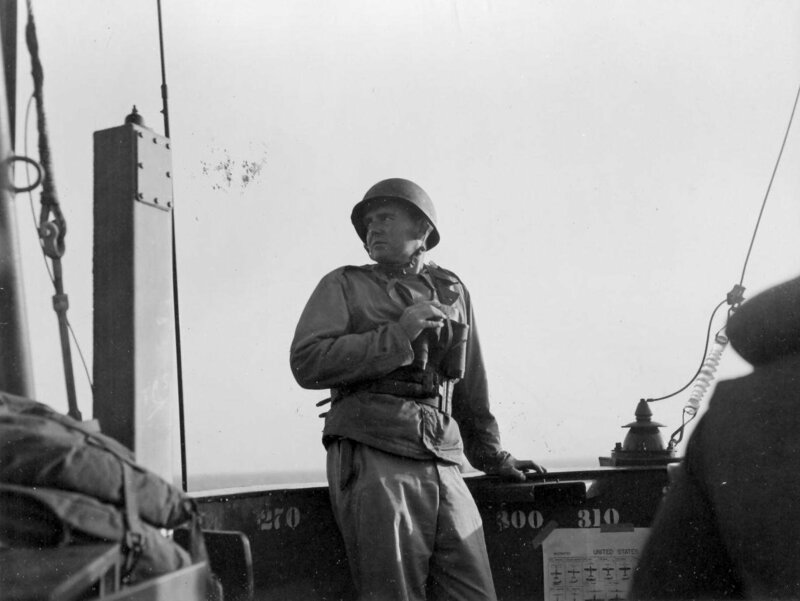 153k LTjg Edward P. Herald mans the bridge aboard USS LC(FF)-370 during General Quarters while underway off the invasion beaches at Okinawa, circa March-June 1945. LCI(R) Flotilla 16 aboard. 184k USS LC(FF)-370 underway off the invasion beaches at Okinawa, circa March-June 1945. LCI(R) Flotilla 16 aboard. 146k USS LC(FF)-370 underway off the invasion beaches at Okinawa, circa March-June 1945. LCI(R) Flotilla 16 aboard. 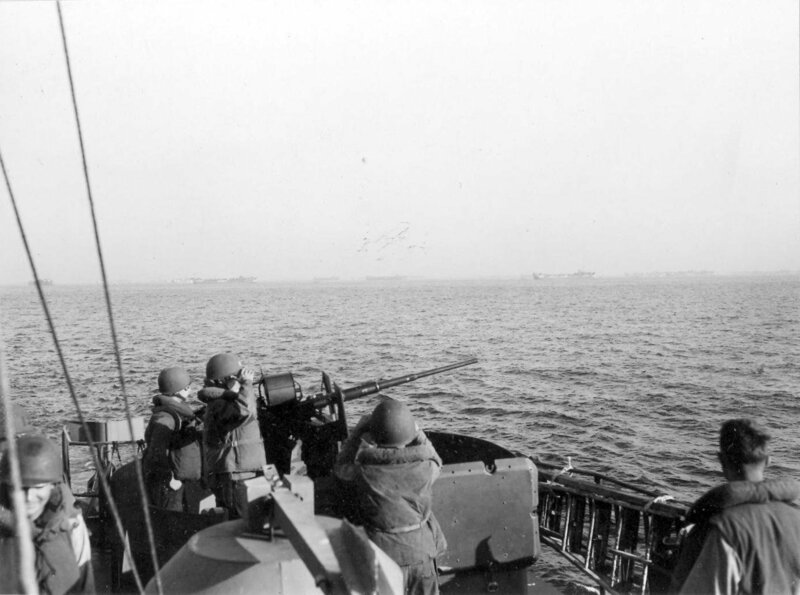 Note the LCIs in the foreground firing rockets. 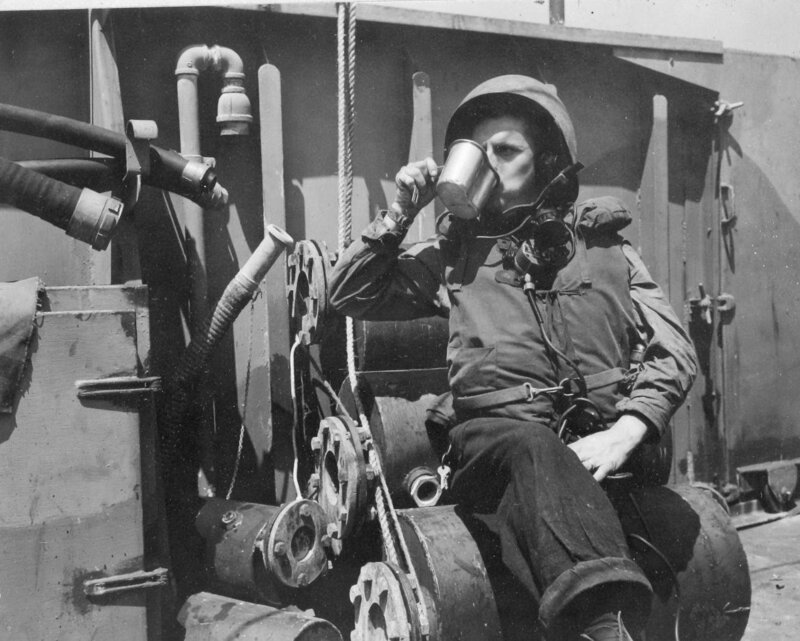 233k USS LC(FF)-370 crew member takes time to eat and drink something while at General Quarters aboard USS LC(FF)-370 underway off the invasion beaches at Okinawa, circa March-June 1945. LCI(R) Flotilla 16 aboard. 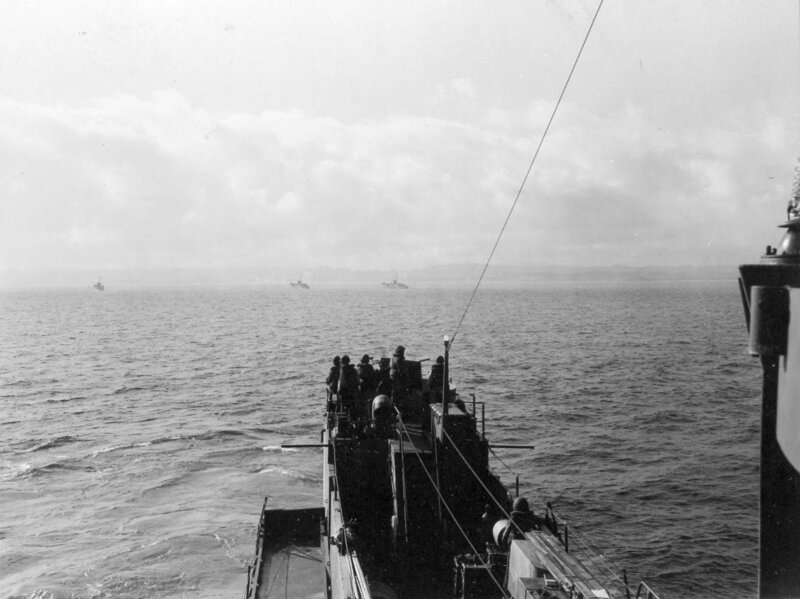 151k Okinawa invasion seen from USS LC(FF)-370 left to right A. Chipolus, John A. Baker and Ens. Harold C.F. Elm., circa March-June 1945. 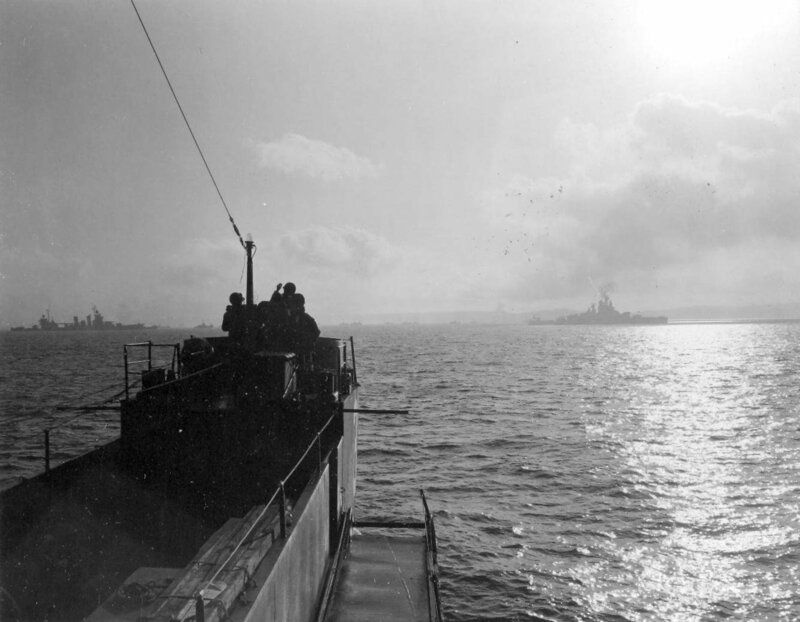 163k Looking aft toward the conning tower and superstructure of USS LC(FF)-370 while underway off the invasion beaches of Okinawa, circa March-June 1945. 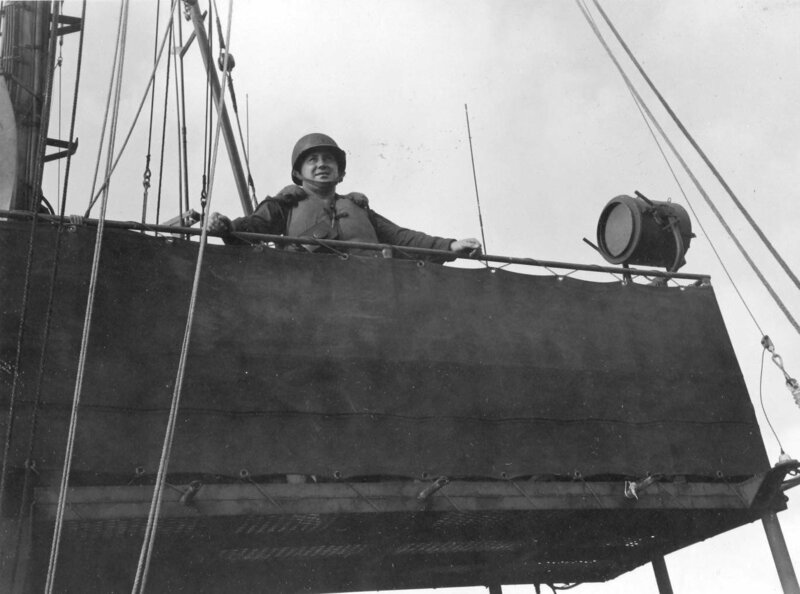 Note the large array of antennas needed to support LCI(R) Flotilla 16 staff. 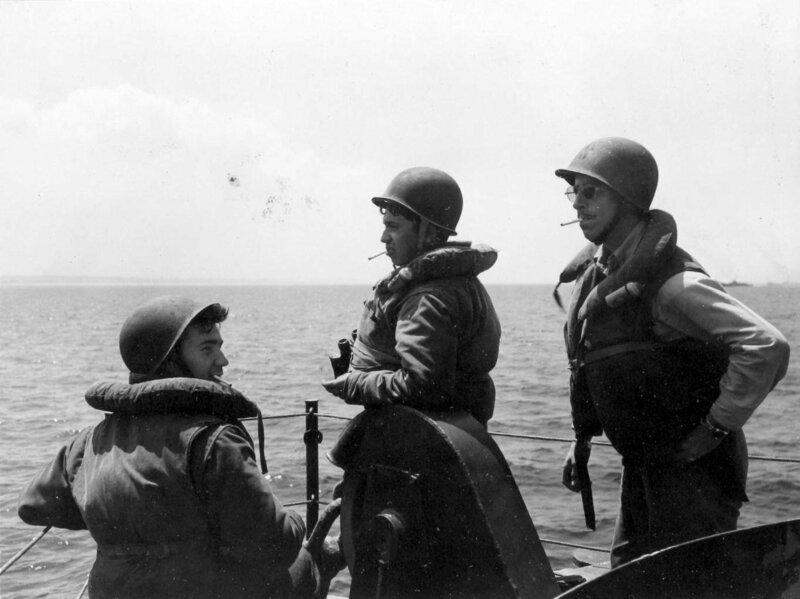 204k L-R LCI(R) Flotilla 16 staff members; Edwin Williams PhoM3c, Ted Darby SK1c, Robert Kremer CPhM aboard USS LC(FF)-370 while underway off the invasion beaches of Okinawa, circa March-June 1945. 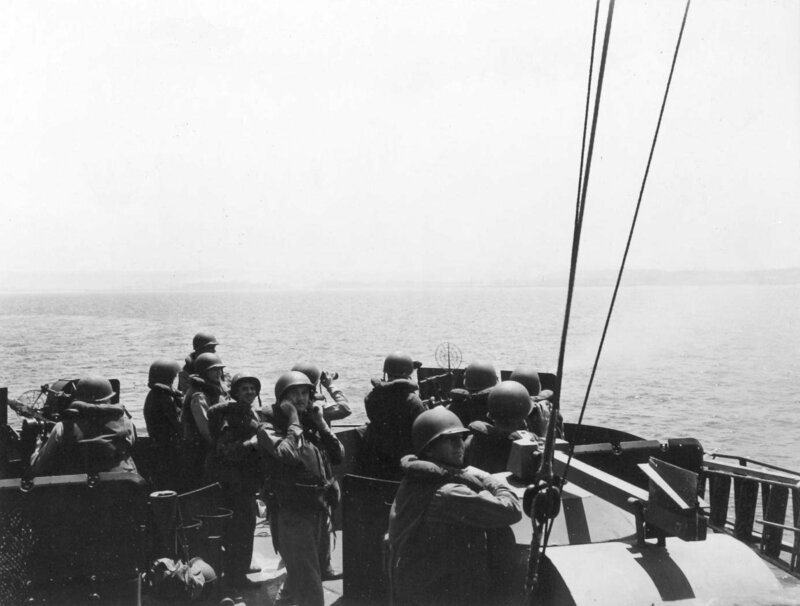 139k LCI(R) Flotilla 16 staff aboard USS LC(FF)-370 while underway off the invasion beaches of Okinawa, circa March-June 1945.